This year’s Orgatec show in Cologne was essentially the world of work as imagined by Generation Y. It was out with the black task chair, the grey pedestal and the fixed workstation — and in with millennial pink and products that espoused the organisers’ central theme of ‘culture@work’ with settings in the workplace that promote collaboration and flexibility in abundance. Though firmly Generation Xers themselves, Edward Barber and Jay Osgerby embodied this trend with Soft Work for Vitra. 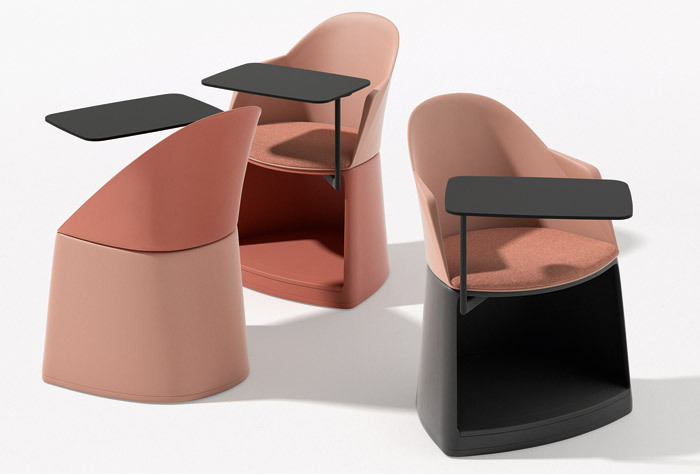 The British design duo declared the death of the desk with this new modular seating, which has straight or curved sections and can be interspersed with tables and screens. The British pair have recognised that people now work more in public spaces, and have given that practical need a bit of Barber and Osgerby magic. Soft Work has the height and lumbar support to finally make working on a sofa comfortable, whether that’s alone or gathering around with additional chairs and tables. Expect to see it in an airport lounge, hotel lobby or atrium space near you soon. For the second time, Vitra took over an entire hall and while it didn’t have the shock of the new, it was still a bold show of strength from the Swiss manufacturer, featuring everything from bleacher seating and a basketball court to a celebration of cafe culture. And those exhibiting alongside — including Forbo flooring, Kvadrat Soft Cells and lighting firm Wästberg — undoubtedly got a sprinkling of the Vitra fairy dust by association. There were still variations on the high-back seat theme, over ten years since it first came to prominence — but if the pieces are all as beautifully realised as Plenum by Jaime Hayon for Fritz Hansen, then long may the design continue. 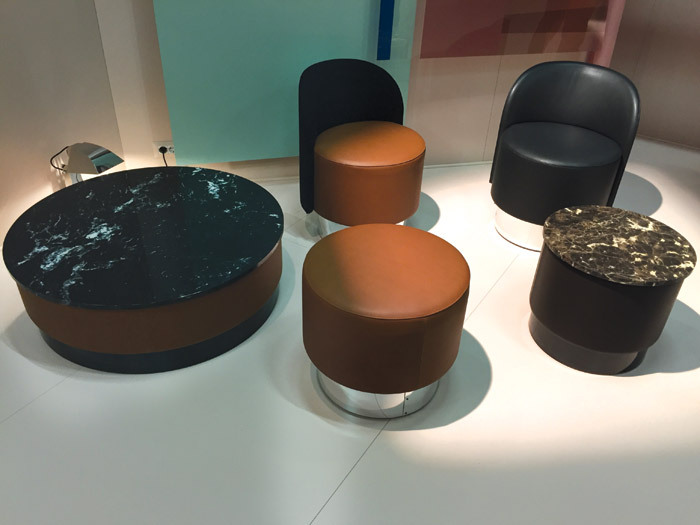 But this year really belonged to the snaking modular seating concept, which slithered its way into many collections around the fair, from Actiu to Casala to Dauphin. Even Norman Foster got in on the act at Walter Knoll, with the Foster 620 design. Business was brisk with barely standing room on many stands, including Arper’s, the art direction of which featured on-trend blush and biscuit shades with pops of mustard. Visitors were clearly keen to get a glimpse of Stacy, its stackable conference seating, Paravan, its modular acoustic panel and Planesit, one of the few task chairs that really stood out in an Orgatec year where soft seating was king. Jeannette Altherr, part of the design team behind all three, explained that they all tied in to Arper’s theme of lifelong learning. As students become first jobbers with skills that are in demand, such as in digital, so there is a convergence in how places of education and places of work look — and manufacturers are offering furniture that can be suited to both. Tacchini’s Pastilles collection — of an armchair, ottoman and coffee table — goes back even further in life, referencing the shape of sweets from childhood. Work To Go, a project organised between the Düsseldorf design school AMD and partners including Steelcase, Microsoft, Interface and Zumtobel, saw students themselves putting forward ideas of how the world of work fits into future living, with zones for home and office plus a ‘freespace’ with cafes to touch down and check emails at and a ‘mindroom’ where keynotes and panel discussions took place. The central tenet of everyday life defining our work rather than work defining our everyday lives rather appeals, and like all the most forward-thinking exhibitors at this year’s Orgatec, this stand was an Instagrammer’s paradise, complete with an installation of flip flops dangling from the ceiling. The idea of bringing the outdoors in continued from the last Orgatec edition in 2016, where planting and greenery had begun to creep onto a few stands. Fast forward two years and no product display was complete without succulents, spider plants, even whole tree trunks and branches in some cases, promoting the ideas of greening the office. Wood was everywhere, from desk surfaces to bar stool legs; even the standard stark white exhibition stand was given the timber treatment on quite a few occasions. In sustainability terms, Humanscale was one company putting some substance behind the greenwash with its Smart Ocean chair. An adaptation of the Diffrient Smart chair, it includes almost one kilogram of recycled fishing net material, sourced from Bureo, which works with fishermen to salvage and repurpose discarded nets. Making outside space in the workplace more professional — a must, given the proliferation of roof terraces in office blocks these days — means producing outdoor furniture that goes beyond the desk chair. Firms such as +Halle and Extremis have excelled at producing colourful, practical designs that wouldn’t scare a corporate client and that would work seamlessly from inside to out. While new single desk designs were in short supply this time around — it was all about the conference table — one other notable design detail was the arm-mounted tray table, once the preserve of the aeroplane exit row, now ascended into many manufacturers’ collections. Laptop-toting millennials would definitely approve. Architects can use the modularity of this seating design by Barber and Osgerby to either create focal points for collaboration or define public areas. It has everything the mobile worker needs: multiple power points, an armrest-mounted tray table and ample lumbar support. This range of seating includes a stool, chair and an armchair designed for learning or training environments with variations to suit quiet, concentrated work or more collaborative situations. The storage detail underneath the seat pad for books, briefcases, backpacks or laptops is particularly inspired. Tapping in to the trend for products suitable for schools and universities as well as offices, Handy is a fun yet practical design by Stephen Philips of Arup. It is made of polypropylene and is also stackable, making it a collaborative workspace must-have. A new generation of storage with wheels and available in millennial pleasing colours such as blush and peppermint, this design by Claudio Dondoli and Marco Pocci is made up of large polypropylene drawers and tops, housed in a coated steel frame. 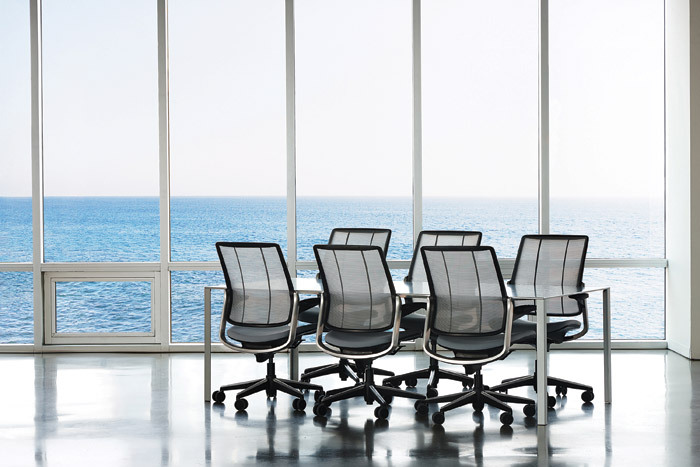 One of a number of means by which Humanscale is upping its sustainability game, the Smart Ocean takes a classic task chair design — in this case the Diffrient Smart chair — and thanks to a collaboration with environmentally conscious startup Bureo, gives it a positive impact on the environment by using one kilogram of recycled plastic from repurposed fishing nets. This new family of seating from Tacchini — all with soft, sinuous shapes — consists of an armchair, an ottoman and two tables in different sizes. 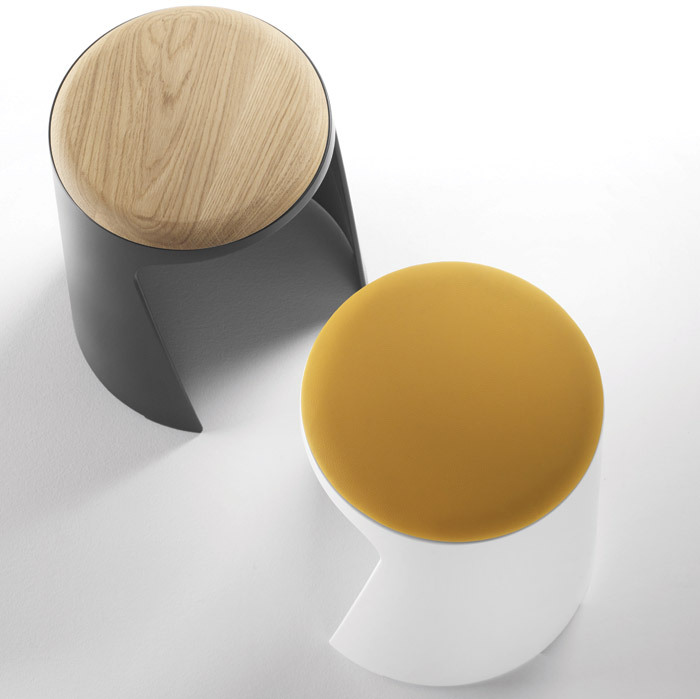 Designers Studiopepe were inspired by childhood memories and the shape of traditional sweets. In an Orgatec year where distinctive desk and workstation designs were a rarity, comes Landscape by British designer Simon Pengelly for Alias. With its wooden desk surface options and divider panels mounted from a single slot in shades of pink and grey, it’s bang on trend. Landscape comes in Meeting, Executive and Essential versions, the latter crossing over into hospitality. 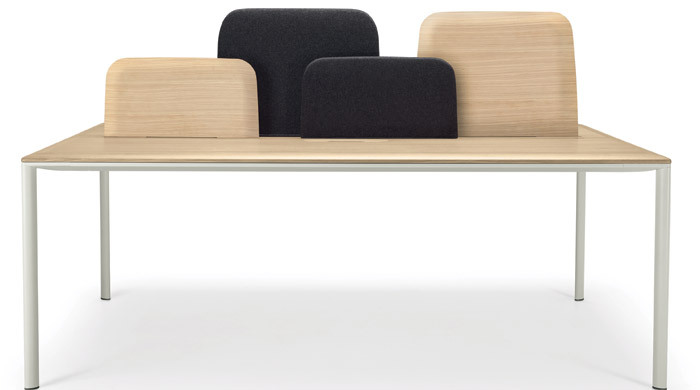 Silq is the new task chair from Steelcase, one of the partners for Work To Go. Silq delivers on the promise of a seat that intuitively works with the body rather than users having to reach down and fiddle with a series of levers to get comfortable (there’s just one, for height-adjustability). Having researched industries as diverse as aerospace and prosthetic limbs, Silq’s secret is in its materials — carbon fibre to be precise (or at a lower price point, a specially developed polymer).